Brainwashed - Alva Noto/Ryuichi Sakamoto, "Glass"
Carsten Nicolai and Ryuichi Sakamoto have a fairly lengthy history of collaborations, but this is an especially fascinating (if brief) one: an improvised performance in Philip Johnson’s legendary Glass House that coincided with the opening of a Yayoi Kusama installation. A lot of the appeal unsurprisingly lies in the duo's process, as they used the house itself as an instrument, contact mic’ing the walls and rubbing them with rubber mallets. However, Glass is also quite beautiful as a pure listening experience, striking an absorbing balance between ghostly ambiance and a crystalline and glittering rain of slow-motion glass fragments. Nearly any good site-specific work of sound art is going to evoke a strong sense of place, particularly if the site is one as unique as The Glass House. The early moments of Glass, however, evoke something very different than a serene and pastoral masterpiece of modern architecture. Instead, it feels like I am in the subterranean depths of a vast and deserted parking garage in the middle of the night. I can hear the distant hiss of traffic, yet the most prominent sounds are disconcertingly loud and echoing drips, along with an ominous and steadily strengthening hum. As that hum becomes louder and more layered, it feels increasingly supernatural, as if flickering phantasms are quietly emerging from the walls and shadows to encircle me. It is hard to quite put my finger on the exact moment when things change, yet my surroundings seem to seamlessly dissolve at some point into something that feels even more haunted, but more otherworldly and futuristic. It is a lot like waking up from a nightmare only to realize that I am actually in a different nightmare, like a Russian nesting doll of uncomfortable dreams. I recognize that I probably reference Tarkovsky more than is healthy, but the lion's share of Glass feels like I have awoken in the world of Solaris and my sanity is being steadily gnawed away by escalating hallucinations and a dawning sense that my orderly, sterile surroundings are actually fluid, illusory, and potentially malevolent. Of course, in order to experience the absorbing and creepily revelatory beauty of this album, I first had to realize that Glass is an album that necessitates extreme volume. If I listen to it casually at a normal level, it sounds like a likeable spectral drone album enlivened by an occasional flurry of crystalline processed crotales or an unexpected blurt of tormented synth. Experienced more immersively at heightened volume, however, the subtle details spring to vivid life and Glass coheres into a purposeful and haunting arc. At its best, it feels like a dazed walk through endless brightly lit corridors that eerily bend, warp, blur, flicker, and reshape themselves like they are disturbingly alive. There is definitely an otherworldly beauty to the dreamily blurred drones and the twinkling, falling icicle-like interludes, yet there is a rising darkness and slowly dawning horror that curdles the piece into something like a grotesque caricature of an angelic choir: unnerving dissonances creep into the harmonies, drones slowly undulate like phantasmal serpents, and an occasional tormented squeal cuts viscerally through the fog. The steadily massing and darkening miasma of blurred and ghostly tones casts an absolutely beguiling spell–the role of everything else is merely to inject life, contrast, and unpredictability into its slow yet inexorable intensification. I am not sure how much of the piece was improvised and how much was planned in advance, but Glass feels like a very deliberate and organically building piece precisely because the central theme is so simple and perfect and all of the peripheral textural flourishes are executed with an impressive lightness of touch. Even the more cutting and structured moments feel like they are ephemerally emerging from an enchanted mist that will soon reclaim them. The only questionable decision comes during the piece’s final third, as someone delves into something that sounds like a bleary melodica solo (I am guessing Sakamoto is the culprit, unless the supernatural power of the piece inadvertently summoned Augustus Pablo from the spirit world). While that solo gamely adheres to the piece’s floating and indistinct aesthetic, it nevertheless transforms the entire feel of the piece in a significant way. Pre-solo, Glass is a gorgeously eerie dreamscape ingeniously crafted from the sounds of glass. Once the solo appears, however, the illusion dissipates somewhat and the piece instead feels like a human musician improvising a melody over a particularly surreal and unconventional backdrop. Naturally, that has its appeal too (especially given the caliber of the artists involved), but it is enough to downgrade Glass from "sublime, understated masterpiece" to "a very interesting performance with flashes of genuine brilliance." 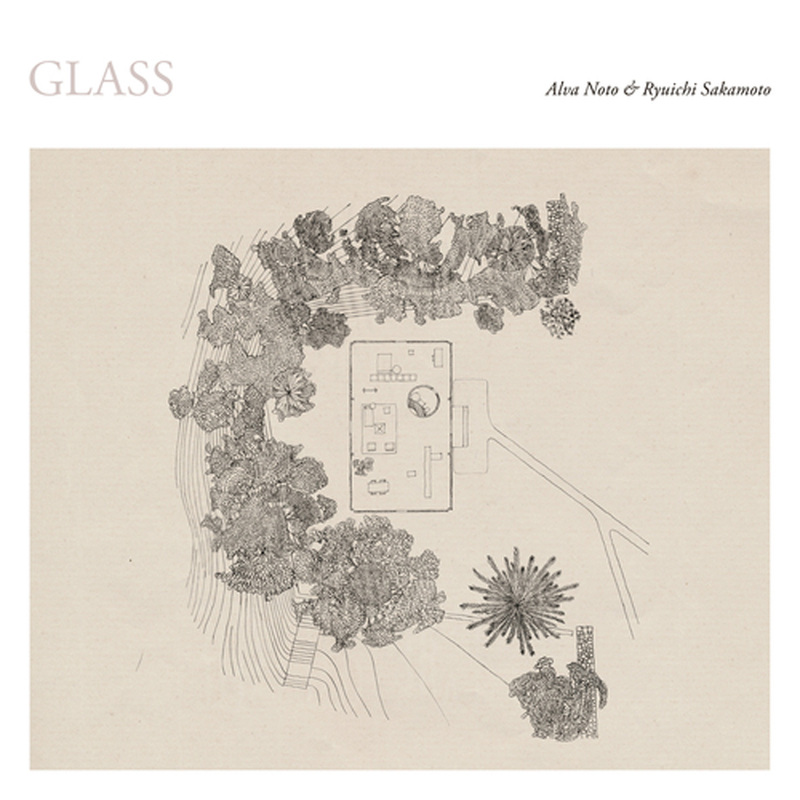 I suppose that is unfortunate, as it is always the albums that come closest to greatness that break my heart a little, but it does not change the fact that Glass is still one of the most significant and inspired works of serious sound art that I have heard this year.